JAPANESE chain Sushi Tei jumped on the poke bowl bandwagon when it added this to its regular menu at the end of January 2018. Poke (pronounced “poh-kay”) is a Hawaiian one-bowl dish comprising cubes of raw fish marinated in a dressing (usually soya sauce) and served with nuts, fruit and vegetables such as avocado, mango, pickles, pine nuts or salad greens. The classic poke seafood is tuna or cured octopus. Sushi Tei’s Chef Choo Kian Yit (left) says the new poke bowl is “a simple, nutritious meal that can keep you going the rest of the day” and indeed the portion is satisfying. There are four Poke Bowls with calorie counts of only 400-469 per serving. The base is brown rice from the Akita Prefecture in Japan. This super-premium, short-grain rice is firm, with a faintly nutty taste. The Magura Poke Bowl (RM23.80) is topped with tuna chunks, kyuri, chia and melon seeds, chopped almonds, crab stick, pickles, fresh salad and sesame seeds. The Salmon Poke Bowl (RM21.80) has fresh salmon, kyuri (cucumber), Japanese black beans, chia and melon seeds, chopped almonds and fresh salad. There is also an Ebi (shrimp) Poke Bowl (RM27.80) with tiger prawn. The fourth, Chicken Teri Poke Bowl (RM18.80) is not a true poke as instead of seafood, it’s topped with grilled chicken, kyuri, chia and sunflower seeds, chopped almonds, pickles, fresh salad and sesame seeds. Customers can choose from 3 dressings: Wafuu onion sauce, wasabina sauce and apple sauce. I like the apple sauce best, probably because it has a mild “pedas” edge that’s pleasing to my tastebud. Sushi Tei also has a treat for vegetarians (however, some dishes may contain garlic, leek, dairy and egg). First, the maki rolls (RM13.80): Avocado Yasai Roll and Inari Yasai Roll. while Inari Yasai Roll (RM13.80) is rolled with beancurd skin and topped with edamame. The Avocado Roll is sushi rice, carrot, radish, takuan (pickled radish), sweet potato, mayonnaise and seaweed wrapped with slices of avocado and topped with sweet Japanese black beans while the Inari Roll has takuan, asparagus, kanpyo, egg, seaweed, mayonnaise and sushi rice rolled with beancurd and topped with edamame. Okura Natto To Yamaimo Senggiri (RM6.80) is an acquired taste and I must admit that I haven’t quite acquired it. I find the slimy natto (fermented soya bean), Japanese yam and sliced ladyfinger quite overwhelming and only manage to eat a quarter of the serving portion. It’s topped with seaweed and a soft-boiled quail egg. But there are lots of lovely side dishes. My favourites are Potato Gyoza (RM9.80) and Satsuma Imo To Kabocha Salad (RM7.80) which is cubed Japanese sweet potato with mashed pumpkin and raisins to add sweetness. 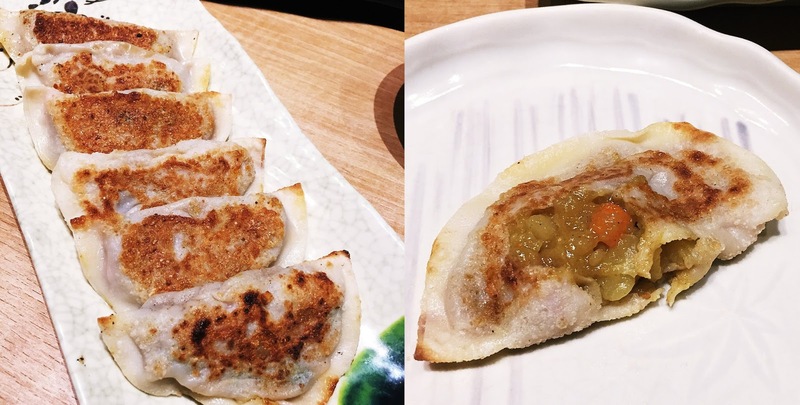 Gyoza usually has a meat filling but the potato gyoza proves to be a refreshing change. Dipped in chilli-soya sauce, it tastes like a soft curry puff. Best eaten hot but do beware as the hot filling can burn lips. Then there are croquettes – Edamame, Sweet Potato and Pumpkin (RM8.80- RM9.80). There are also vegetable curry rice and fried rice with vegetables as well as Namako Yasai (RM21.80), which is a treasure bowl with wedges of pumpkin, sweet potato, button mushroom, tofu, shredded scallions on noodles (udon/ramen/soba) in a miso stock. What throws me off balance is the sight of sea cucumber but this turns out to be a vegetarian substitute made from konjac, so it’s crunchy and bouncy in texture. I shall try when I get the chance.